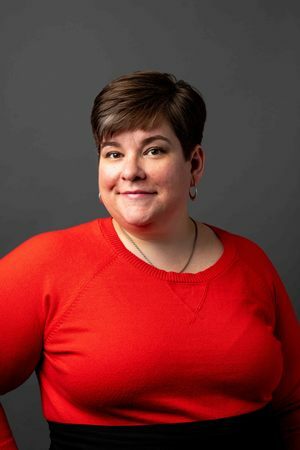 Our Bright Young Librarians series continues today with Whitney Buccicone, Special Collections Cataloging Librarian at the University of Washington in Seattle. I am the Special Collections Cataloging Librarian at the University of Washington (UW) in Seattle. I am responsible for cataloging all the amazing materials, both print and archival, that are housed in UW’s Special Collections. I also create and modify authority records and subject headings for NACO and SACO. Beyond that, I do my best to help diminish backlogs, document procedures, and make sure workflows are efficient. I began as a page at the Lilly Library (Indiana University Libraries rare books and special collections library) when I was 20 and a junior at Indiana University. Pages retrieve materials from the Lilly’s closed stacks for patron and staff use then reshelf them after (along with other duties). My first boss there called me “the Robot” because I never misshelved a book and understood the Library of Congress classification system quickly. I continued doing well enough that I eventually was convinced by my boss at the time to go to library school. I began cataloging during that time and was hired in a full-time temporary cataloger position after graduation. From there, I was promoted to permanent paraprofessional positions and worked there for almost 9.5 years before coming to UW in a librarian position. I received both my MLS and Master’s in Arts Administration from Indiana University in Bloomington, Indiana. I have too many favorites to name but the most recent is a commonplace book purchased by our Curator of History of Science and Medicine, Lisa Oberg. The original book was a text on chemistry (First lines of the practice of physic, for the use of students in the University of Edinburgh by William Cullen, M.D., printed in 1777). That text was annotated by someone previously before a ship’s doctor from the British Navy pasted articles about agriculture and gardening from magazines and included his own annotations about those throughout. Before all of that though, the book was unbound and newspaper from France was used to reinforce the spine of each gathering. The book was then rebound. What makes this my favorite item is just the obvious impact that owners on their books. That’s what has always excited me about working in special collections -- we preserve and provide access to humans’ impacts on books and vice versa. In regards to books, I collect sci-fi/fantasy and poetry written by women of color. I also have a robust comic book collection where I focus on comics from the early 1990s as well as a vinyl collection that highlights all my favorite artists from my childhood. I love to thrift shop to find art, jewelry, and old ceramics to plant succulents in. I garden (which is rather difficult in Seattle), knit, and read. Collaborating with my colleagues -- whether that is a curator here at UW or with another cataloger at a different institution. The more we share knowledge, the better we serve our users by creating accurate and detailed catalog records, finding aids, and exhibits. I see so much of that at conferences, on Twitter, and other places -- I am grateful to be surrounded by colleagues who want to share knowledge freely and warmly, not horde it away. Being an older “Bright Young” librarian, I am excited about the colleagues I see coming up after me. I trained multiple catalogers who are now off doing amazing work across the country and that makes me feel that the future of our field is in great hands. I’m happy to be working alongside them and hope to continue to collaborate with them. We have so many great collections at UW Special Collections. Our Jewish Archives has oral histories from Holocaust survivors and preserving that history of a marginalized community is very important to our mission here. We also have some amazing ephemera: butcher knives from the local butchers union; scientific instruments going back to the early 19th century in our History of Science and Medicine collection; and some of the earliest maps detailing the Washington Territory. In fall 2019, our exhibit will be “The Seattle General Strike and Centralia Tragedy of 1919: the legacy of the Industrial Workers of the World in the Pacific Northwest” curated by Conor Casey, our Labor Archivist. Our Labor Archives is a wonderful resource for those researching the labor movement and other social justice issues and this exhibit will focus on a transformative time for the labor movement in the PNW. I am the Special Collections Cataloging Librarian at the University of Washington (UW) in Seattle. I am responsible for cataloging all the amazing materials, both print and archival, that are housed in UW's Special Collections. I also create and modify authority records and subject headings for NACO and SACO. Beyond that, I do my best to help diminish backlogs, document procedures, and make sure workflows are efficient. I began as a page at the Lilly Library (Indiana University Libraries rare books and special collections library) when I was 20 and a junior at Indiana University. Pages retrieve materials from the Lilly's closed stacks for patron and staff use then reshelf them after (along with other duties). My first boss there called me "the Robot" because I never misshelved a book and understood the Library of Congress classification system quickly. I continued doing well enough that I eventually was convinced by my boss at the time to go to library school. I began cataloging during that time and was hired in a full-time temporary cataloger position after graduation. From there, I was promoted to permanent paraprofessional positions and worked there for almost 9.5 years before coming to UW in a librarian position. I received both my MLS and Master's in Arts Administration from Indiana University in Bloomington, Indiana. I have too many favorites to name but the most recent is a commonplace book purchased by our Curator of History of Science and Medicine, Lisa Oberg. The original book was a text on chemistry (First lines of the practice of physic, for the use of students in the University of Edinburgh by William Cullen, M.D., printed in 1777). That text was annotated by someone previously before a ship's doctor from the British Navy pasted articles about agriculture and gardening from magazines and included his own annotations about those throughout. Before all of that though, the book was unbound and newspaper from France was used to reinforce the spine of each gathering. The book was then rebound. What makes this my favorite item is just the obvious impact that owners on their books. That's what has always excited me about working in special collections -- we preserve and provide access to humans' impacts on books and vice versa. Being an older "Bright Young" librarian, I am excited about the colleagues I see coming up after me. I trained multiple catalogers who are now off doing amazing work across the country and that makes me feel that the future of our field is in great hands. I'm happy to be working alongside them and hope to continue to collaborate with them. In fall 2019, our exhibit will be "The Seattle General Strike and Centralia Tragedy of 1919: the legacy of the Industrial Workers of the World in the Pacific Northwest" curated by Conor Casey, our Labor Archivist. Our Labor Archives is a wonderful resource for those researching the labor movement and other social justice issues and this exhibit will focus on a transformative time for the labor movement in the PNW.